In today's crowded cities with eachyear there are fewer areas for parks and natural spaces and the air emissions of gases continue to pollute. An excellent way out of this situation are the gardens on the roof. They - small green filters, the true nature of the islands, carrying peace and beauty. 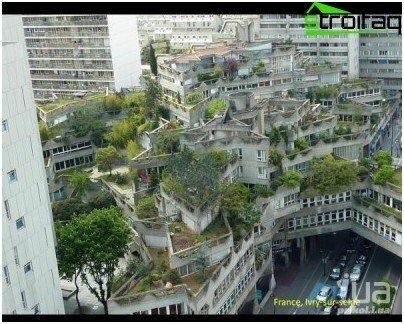 Green oases created by human hands on rooftops, save the inhabitants of megacities, not only from a contaminated air. It is also an effective remedy for stress. What could be better than relaxing on the green lawn, arranged on the roof? 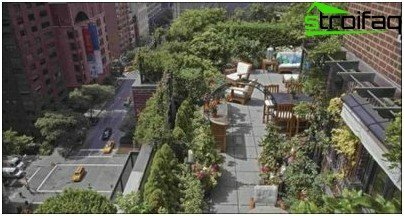 In other words, on the roof garden - is an additional space for the life of the city dweller. Consider the following, what is it so good, and what are the characteristics of its devices. 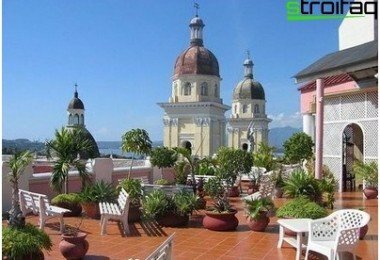 How to arrange a garden on the roof? Which plants to choose for the roof garden? It reduces air pollution, because the plants absorb carbon dioxide and release oxygen in return. In addition, herbs keeps dust and toxic substances contained in the air. 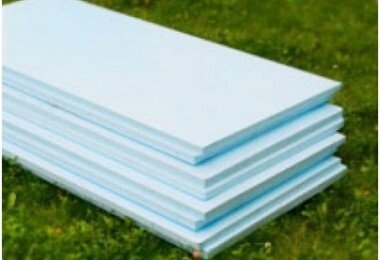 Raised roof has excellentinsulating properties: it reduces the heating of the roof in the heat, in the winter, on the contrary - does not give warmth to go outside. Thus, reduced costs (about 20%) for heating the house in winter and air conditioning in the summer. The gardens on the roof (if there will be many) are able to reduce the temperature of the air the whole district, and even the city as a whole. It absorbs the precipitation, preventing them from floodingstreets with showers. Gradual evaporation of rainwater, which is absorbed into the soil on the roof, helps to maintain the natural moisture, creating a healthy environment. Compensates space, returning to the ownerdied under construction green lawns. When constructing a green roof increases the operational area of ​​the building, there is an opportunity here to equip a great place for a pleasant stay. 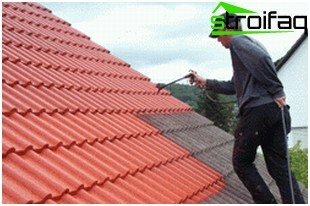 It protects the roof from harmful effects of weather conditions - rain, snow, heat, cold, prolonging its life. 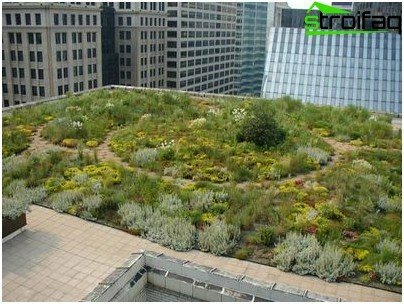 The green roof will last without repair at least 20 years. Green roof improves the building, she always looks beautiful and impressive. 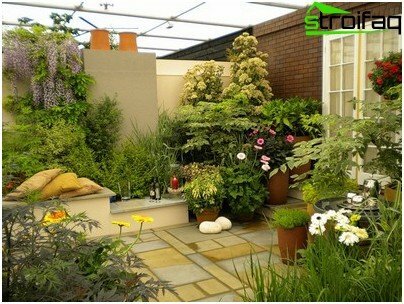 Depending on the use of the principle of garden landscaping of the roof is of two types: intensive and extensive. at intensive gardening in the garden there is the most active vacation. Therefore, no lawns, flowerbeds and paths can not do. This greening of the roof requires the use of larger plants, including shrubs and trees. 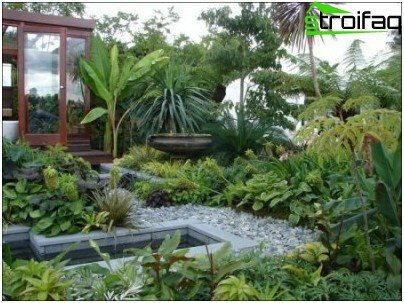 Often the design of landscape design apply alpine gardens and even small ponds and in special containers have a whimsical and exotic plants. For hot days in the garden on the roof, you can arrange a shady area with a hammock and lounge chairs, of course, if the area allows. 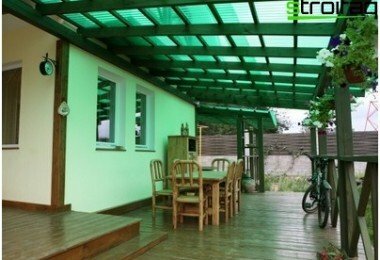 This type of roof greening is most suitable for private homes. In this case, the load on the structure will be considerable, sometimes reaching 900 kg per sq.m. extensive method It does not involve any additional facilitiesfor a man, the priority here are plants for the garden. All work on the landscaping done in this case, only to create a favorable environment for plants. This method is used on flat roofs or roofs with a slight slope to reduce the need of constant care for her. The weight of the roof in this case is usually not more than 15 kg per sq.m., so there is no further need to strengthen the foundation. If the plant perennials that are hardly in need of care (mowing, watering), this roof will be long enough to exist on its own. 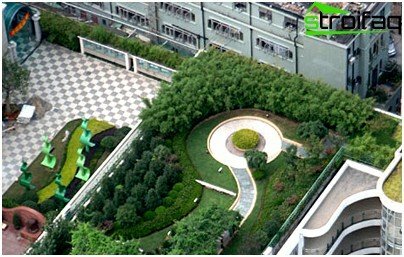 Extensive landscaping roofs of buildingsIt is most often used for the decoration of terraces, shopping centers, garages. 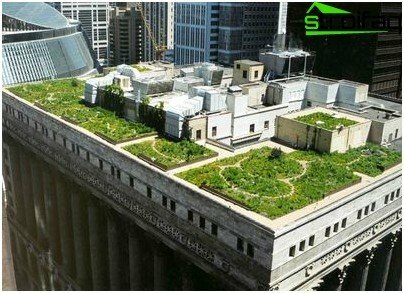 If greening works have been carried out by specially trained people and all requirements have been taken into account, then soon on the roof formed a real ecosystem with small birds and insects. The first thing you need to calculate what will be thethe load on the foundation and the roof, because they will have to bear the additional weight of fertile soil, and the plants themselves. In addition, the roof can be placed on various decorative elements, the necessary equipment and some furniture. We need to create conditions that will not allow plant roots to grow strongly, because this process is quite natural for them. 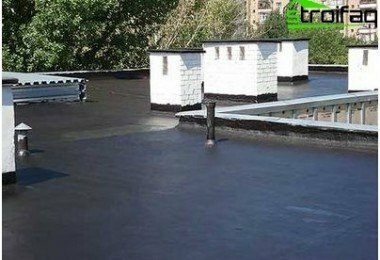 In the place where the future garden, you need to make a reliable waterproofing of the roof will be laid. It is necessary to carefully consider the device systemsirrigation and drainage. 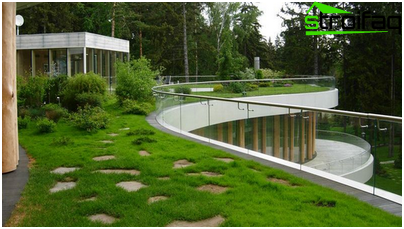 Because the green roof requires periodic watering, should develop excess water drainage system, as well as to maintain its required amount for the existence and successful plant growth. For lawn useful conventional nozzles, and planted in a container the plant is better to water drip irrigation method. The garden should be illuminated at night, so you need to hold back and electricity. Important! 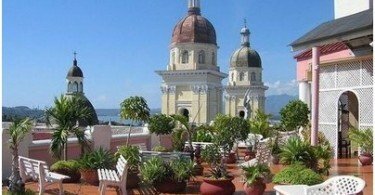 Since the green area on the roof is for people to think about security measures when traveling on the roof: on the edges of terraces it is necessary to create a reliable parapet. The first step - the creation of a complete waterproofing. To this end, lined with slabs of bitumen-polymer rolled materials. The lower layer is attached to the base by mechanical means and the upper weldable. The second step - laying insulation layer in the form of slabs of extruded polystyrene. They are placed tightly, but without committing not to disturb the layer of waterproofing. Then drain arranged between the layers of the web material - geotextile, which the band put one layer overlap. To use a layer of drainage gravel or pebbles. In the resulting "cake" is poured soil and planted the plants and trees. As in any other garden, you can create flower beds, lawns, paths do. On the roof of the plants start to grow in spring on 4-14days before the bottom of the earth, and with the same time difference bloom, fruit, dress up in the autumn outfit foliage. This should be taken into account when a combination of ornamental plants combinations. Much more important, however, the environmental criteria of their combination - the compatibility of different types of shrubs and trees. 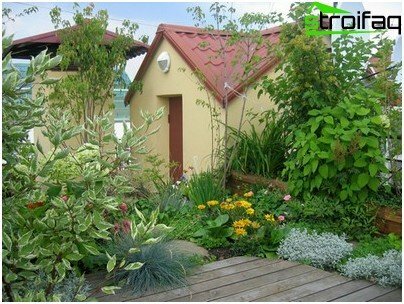 When green roof is recommended to plantunpretentious and hardy plants that are typical of mountain flora. It is better to choose a spirea, physocarpus, dogwood, which with regular haircuts become in the near future in the luxury Topiary. Nice feel plants planted in large capacity containers. mountain pine, arborvitae suitable softwood,cushion spruce, juniper. Small dwarf trees and stam forms also will be appropriate. And you can not do without the indispensable companion of walls and roofs - a girl's grapes! For greening pitched roofs oftenstonecrops used. On the waterproofing layer is placed a protective film, a special water-retaining sponge and then cassettes stonecrop. When planting stonecrop roof subsequently requires virtually no maintenance. 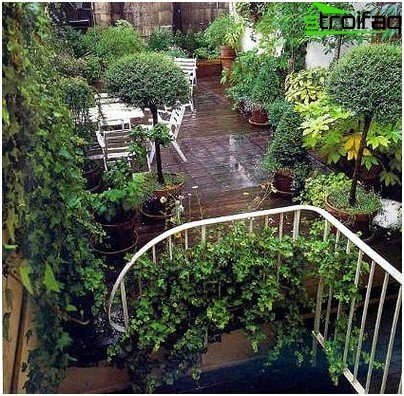 Trends in recent years, calling forthink about the environment and nature, more and more are doing popular roof gardens. And who may not like the idea of ​​their own corner of the wildlife amidst a sea of ​​concrete and asphalt? More recently, green roof building, we considered exotic - it was used mainly owners of luxury town houses and advanced gardeners. 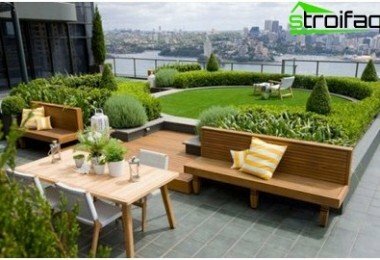 Today we have one more good trend - gardens on the roofs have become popular not only in private homes, but also in restaurants, public and office buildings, banks, sports complexes, and this phenomenon undoubtedly has a bright future.